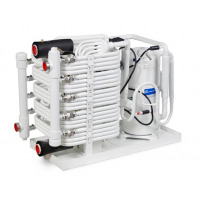 Marine Chiller System	There are 26 products. 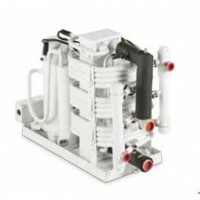 *For the all new line of Dometic Chiller Systems, see here... Cruisair Marine Chiller System. Cruisair marine chiller systems range from 24,000 up to 120,000 BTU units. CRUISAIR MTDV24C Modular Tempering Unit (R410A), 24,000 BTU, 230V, 60 HZ, Single Phase. This marine chiller unit provides installation flexibility, reliability, maximum performance, and easy accessibility for maintenance and repair. 2 Year Warranty. * MFG#: 260151001. 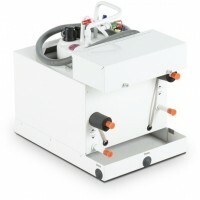 CRUISAIR MTDV30C Modular Tempering Unit (R410A), 30,000 BTU, 230V, 60 HZ, Single Phase. This marine chiller unit provides installation flexibility, reliability, maximum performance, and easy accessibility for maintenance and repair. 2 Year Warranty. * MFG#: 260151005. CRUISAIR MTDV36C Modular Tempering Unit (R410A), 36,000 BTU, 230V, 60 HZ, Single Phase. This marine chiller unit provides installation flexibility, reliability, maximum performance, and easy accessibility for maintenance and repair. 2 Year Warranty. * MFG#: 260151010. CRUISAIR MTDV48C Modular Tempering Unit (R410A), 48,000 BTU, 230V, 60 HZ, Single Phase. This marine chiller unit provides installation flexibility, reliability, maximum performance, and easy accessibility for maintenance and repair. 2 Year Warranty. * MFG#: 260151014. CRUISAIR MTDV60C Modular Tempering Unit (R410A), 60,000 BTU, 230V, 60 HZ, Single Phase. This marine chiller unit provides installation flexibility, reliability, maximum performance, and easy accessibility for maintenance and repair. 2 Year Warranty. * MFG#: 260151019. CRUISAIR MTDV30DC Modular Tempering Unit (R410A), 30,000 BTU, 230V, 60 HZ, 3 Phase. This marine chiller unit provides installation flexibility, reliability, maximum performance, and easy accessibility for maintenance and repair. 2 Year Warranty. * MFG#: 260151008. CRUISAIR MTDV48DC Modular Tempering Unit (R410A), 48,000 BTU, 230V, 60 HZ, 3 Phase. This marine chiller unit provides installation flexibility, reliability, maximum performance, and easy accessibility for maintenance and repair. 2 Year Warranty. * MFG#: 260151016. CRUISAIR MTDV60DC Modular Tempering Unit (R410A), 60,000 BTU, 230V, 60 HZ, 3 Phase. 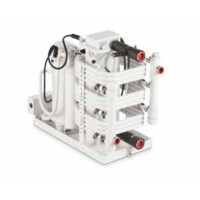 This marine chiller unit provides installation flexibility, reliability, maximum performance, and easy accessibility for maintenance and repair. 2 Year Warranty. * MFG#: 260151021. CRUISAIR MTDV72DC Modular Tempering Unit (R410A), 72,000 BTU, 230V, 60 HZ, 3 Phase. This marine chiller unit provides installation flexibility, reliability, maximum performance, and easy accessibility for maintenance and repair. 2 Year Warranty. * MFG#: 260151025. CRUISAIR MTDV96DC Modular Tempering Unit (R410A), 96,000 BTU, 230V, 60 HZ, 3 Phase. This marine chiller unit provides installation flexibility, reliability, maximum performance, and easy accessibility for maintenance and repair. 2 Year Warranty. * MFG#: 260151028. CRUISAIR MTDV120DC Modular Tempering Unit (R410A), 120,000 BTU, 230V, 60 HZ, 3 Phase. This marine chiller unit provides installation flexibility, reliability, maximum performance, and easy accessibility for maintenance and repair. 2 Year Warranty. * MFG#: 260151031. CRUISAIR MTDV30EC Modular Tempering Unit (R410A), 30,000 BTU, 460V, 60 HZ, 3 Phase. This marine chiller unit provides installation flexibility, reliability, maximum performance, and easy accessibility for maintenance and repair. 2 Year Warranty. * MFG#: 260151009. CRUISAIR MTDV48EC Modular Tempering Unit (R410A), 48,000 BTU, 460V, 60 HZ, 3 Phase. This marine chiller unit provides installation flexibility, reliability, maximum performance, and easy accessibility for maintenance and repair. 2 Year Warranty. * MFG#: 260151018. CRUISAIR MTDV72EC Modular Tempering Unit (R410A), 72,000 BTU, 460V, 60 HZ, 3 Phase. This marine chiller unit provides installation flexibility, reliability, maximum performance, and easy accessibility for maintenance and repair. 2 Year Warranty. * MFG#: 260151027. CRUISAIR MTDV96EC Modular Tempering Unit (R410A), 96,000 BTU, 460V, 60 HZ, 3 Phase. This marine chiller unit provides installation flexibility, reliability, maximum performance, and easy accessibility for maintenance and repair. 2 Year Warranty. * MFG#: 260151030.